Speaking of my love for all things pumpkin earlier this week, I felt compelled to write a post about a festive little package currently relaxing in my icebox. When real beer drinkers are ready for a cold-one on Friday evening after work, it is unlikely they will head straight to the cider beer section at the liquor store. Real beer drinkers turned gluten-free face a harsh reality. No real beer. Ever. Sure, there are alternatives...sorghum, rice and buckwheat. But nothing comes close to the wheat and barely mix which brings richness and depth to that dark frothy mug of bubbly. Accepting this reality, hard cider is one beer-like alternative that us gluten-free people can indulge in. I was beyond excited to see my sweet little Woodchuck's come out with a Private Reserve Pumpkin Cider for the fall season. When in the mood for a cold-one to swig at Friday night's crisp backyard BBQ, Woodchuck meets the call. But be warned, you must like sweet. Woodchuck's are sweet. Not dry. Sweet. Know this so you won't be caught off guard. This is a special cider. Go ahead, dare yourself to love it. 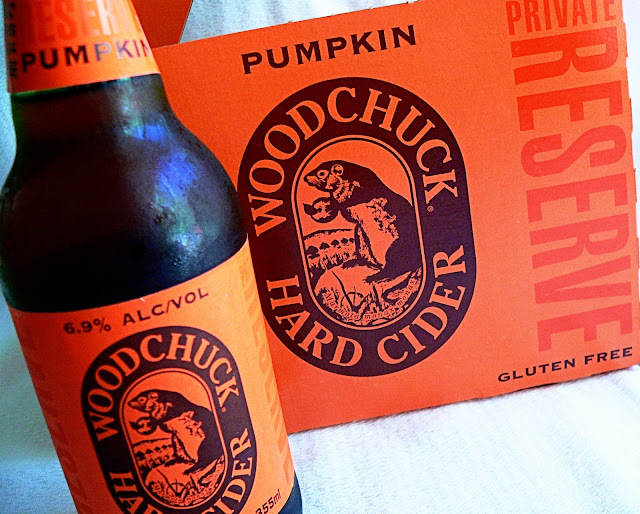 "Woodchuck Private Reserve Pumpkin is limited to only two and a half hours on our production line. Fresh and crisp with pumpkin at the finish, it's crafted to be served at 45 degrees and pairs perfectly with roasted duck, turkey, squash ravioli as well as creme brulee and fresh cheesecake. Be part of the select few who get to savor this small batch." Have it on hand for your gluten-free guests at this year's Halloween party or Thanksgiving dinner. They might thank you for it. Side note: Most hard ciders are naturally gluten-free, but double-check the packaging to be extra sure they didn't add any barely or wheat in the process.